Looks like Benny is going to be famous through his vinyl wall sticker. Originally intended as a one off commission by Wall Glamour, Rick has asked if they could sell it on their site. So if you want a lovely husky puppy sticker for your wall – just go to Wall Glamour, choose your colour and buy this original design. If you want one of your own dog, just contact them direct and Rick will quote. 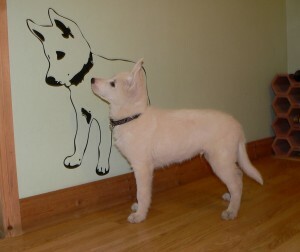 This entry was posted in Siberian Huskies and tagged husky, vinyl wall sticker, wall glamour on March 1, 2010 by Guy Redwood. Over the last 6 months, I’ve been toying with the idea of resigning from the SHCGB committee to free more time to spend on my eye tracking business. I’ve served, without break, as a committee member for about 8 years. In that time seen the SHCGB evolve into the great club it is today. Last week, I emailed the club secretary with the news of my intention. My decision to take a break from committee matters came down to the realisation that I was working quite a few 7 day weeks, leaving little time to spend with the dogs, let alone husky club matters. Attending four committee meetings and an AGM each year is quite a commitment, especially when you factor in preparation and the jobs you walk away with. 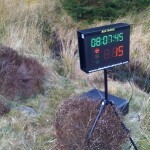 I plan to continue with my role as webmaster for the husky club and co-organiser of the famous Aviemore Sled Dog Rally. The web site will be ten years old this year and will hopefully get the long awaited redesign, now I’ve got a bit more time on my hands. On top of this list of things I’ve remembered, there’s a huge amount of stuff that we’ve just done because I was a committee member or Helen was married to a committee member. We’ve put a lot into the club over the years and got a lot back in return. If you have the time or can make the time, then please do consider putting yourself forward for committee. It is good fun, you get to meet a huge number of people and gain an amazing insight into everything that goes on. 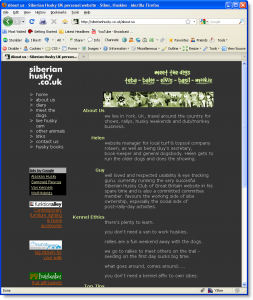 This entry was posted in Guy, Helen, Husky Club and tagged committee, Husky Club, SHCGB on February 13, 2010 by Guy Redwood. I took some more photos of the racehome today as I realised most of the photos on the site were from when it wasn’t complete. There’s still a few jobs outstanding – but it’s a project that will never be finished. I also shot a quick video using my upgrade iphone. This entry was posted in Race Home and tagged conversion, husky carrier, mercedes sprinter, racehome, selfbuild, van on October 18, 2009 by Guy Redwood. Benny was out with the older boys in the dog run, so I thought I’d take a video with the new phone. This entry was posted in Siberian Huskies and tagged benny, Siberian Huskies, video on October 16, 2009 by Guy Redwood. I got a surprise delivery today from my friend at Wall Glamour, the wall sticker people. Rick had taken one of my photos and turned it into a big wall sticker. I first wanted to put it above my desk at work, but then decided to take it home and place it in the kitchen. Only took 5 minutes to put it up, most of that was just deciding what angle to put him at. 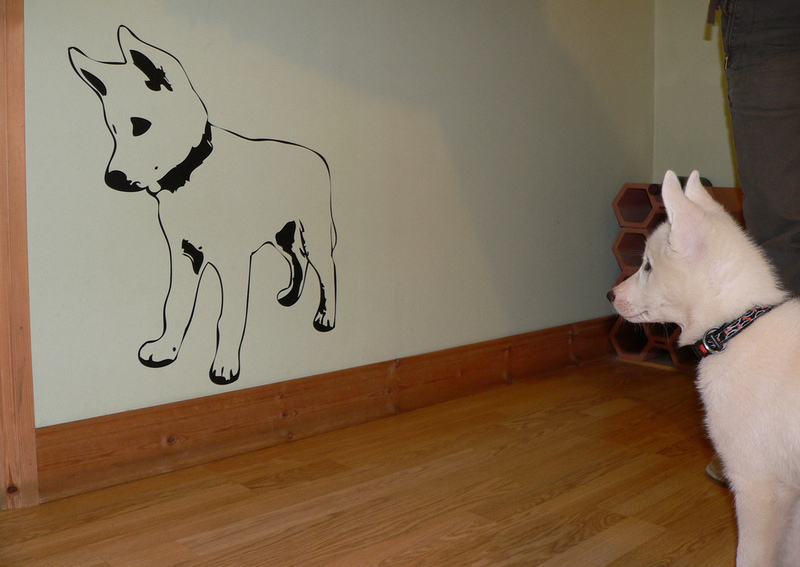 Look really cool and Benny keeps looking at it as he trots past. 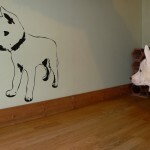 This entry was posted in Siberian Huskies and tagged husky, wall glamour, wall sticker on September 28, 2009 by Guy Redwood. 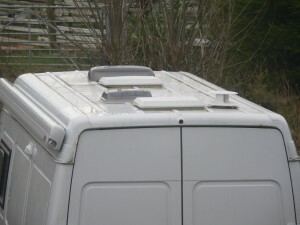 A question was asked on the husky club bulletin board about fitting roof vents, so it prompted me to write the first page about how we converted our van into a high spec race home. The first page is about the glues we used and notes about caravan adhesive and caravan sealant. 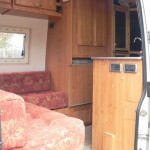 They are a blend of advice I got from professional builders, the self build motorhome website and stuff I learned. This entry was posted in Race Home and tagged caravan adhesive, glue, motorhome, Race Home, Sikaflex on September 26, 2009 by Guy Redwood. Still a work in progress, but we’ve finally made the updated website live. The old site (shown in the image) was getting quite dated and the code was broken. We’ve moved over to a wordpress site using a modified Wootheme. 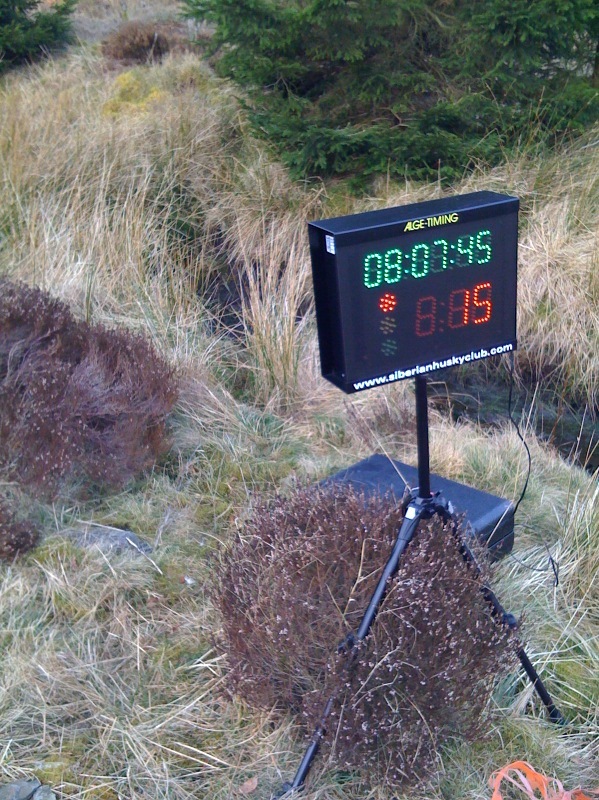 A new controllable webcam is under trial and we’ve finally gone ‘pro’ with the Flickr account. We’re hoping to add more content to this site, covering the things we’ve been asked about over the years and stuff we just want to log as a journal. 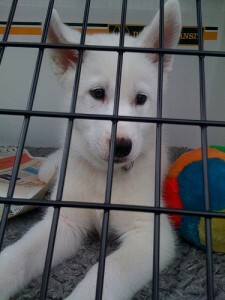 This entry was posted in Guy and tagged siberian husky on September 20, 2009 by Guy Redwood. Benny has been with us now for just over seven days. He’s still an absolute joy to spend time with – whether that’s playing or cuddling. Making me late for work throughout the whole of last week. He loves ripping up newspaper and pulling magazines out from the coffee table. Runs around the house like a crazy thing not really understanding that jumping over the bigger the dogs is not the correct thing to do. Leaps onto the sofa with ease and loves his toys. He’s been very good at night, sleeping in his crate in our bedroom. Not causing any major grief, even if disturbed when I’ve been working late. This entry was posted in Siberian Huskies and tagged benny on September 20, 2009 by Guy Redwood. 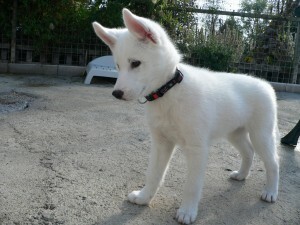 Today, we headed down south to collect our new puppy, Rigrunner Slider – or Benny as he will be known. He was very well behaved in the car, only howling for 5 minutes and then slept all of the way home. Once home,introducing him to the older boys was not as simple as we’d hoped. All of the dogs are not interested in him and Mookie has decided that he really doesn’t need another pal at the moment. 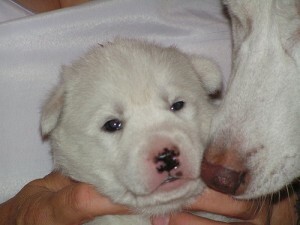 This entry was posted in Siberian Huskies and tagged benny, puppy on September 13, 2009 by Guy Redwood. very much looking forward to welcoming our new pup to chez redwood. he is nearly three weeks old and growing fast. here’s the latest pic of the handsome little chap taken earlier today. more photos can be found on sarah and keith’s website. This entry was posted in Siberian Huskies and tagged puppy on August 6, 2009 by Guy Redwood.